Food lovers, say hello to your very own version of retail therapy. 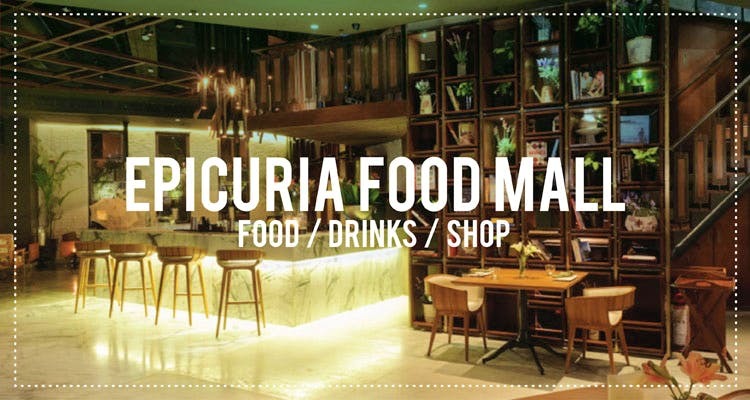 We’re talking about Delhi’s very own food mall – Epicuria. Nehru Place, the city’s IT and commercial hub, has a whole other dimension right opposite the electronic bazaar. This food mall is a gastronomical paradise tucked right under the Nehru Place metro station. With a multitude of cuisines to choose from, Epicuria is a delight to visit and explore. What: More than just South Indian food, this place does some really fluffy appams and a rich Chicken Masala Fry. What: The right place for some Asian Sizzlers and Thai curries. What: A restaurant that does the all day breakfast menu just right. What: Try this Lebanese joint for some late night Shwarmas and Babaghanoush. What: What’s better than a massive slice of some cheesy gooey pizza? Find some here. What: Find Indian and European cuisine, mixing both into a very contemporary menu. What: They have a range of Hot Dogs as well as mocktails. What: A Japanese speciality restaurant known for its teppanyaki grill experience. What: A whopping quantity for one, the Whopper Burger and a milkshake is enough to last you through the day. What: A quick visit to Chai Point for your morning cuppa is a must. They do quite a number of flavours. What: You don’t need to travel to Old Delhi no more. The eatery has the best mutton seekhs. What: Estella Damm, Erdinger Dunkel or Stella Artois, you’ll find more than just your regular beers here. What: An Asian speciality restaurant, find your meal in a combination of Rice/Noodles and chicken main courses. What: North Indian at its richest and tastiest, try their tangri kebabs and soft rotis. What: A chicken lover’s delight. What: Candies! Gummy bears, liquorice sticks, marshmallows and more. Indulge your sweet tooth here. What: A coffee place spot, they also have some amazing dessert options. What: Doing savoury pretzels and hot dogs, this is one of the few places in Delhi that offers the luxury of this American snack. What: A coffee and dessert staple; CCD has a great ambience going, if you want to sit here and work. What: Scrumptious cakes and pastries, L’opera is the joint you must visit for some high end desserts. What: Sandwiches made to order, Subway offers you the freedom to customise bread and toppings. What: The cigar stall has a multitude of premium tobacco based products and accessories for the same. What: Aromatherapy candles and incense. What: A global fitness company, they also offer yoga and other fitness exercises, apart from the basics.